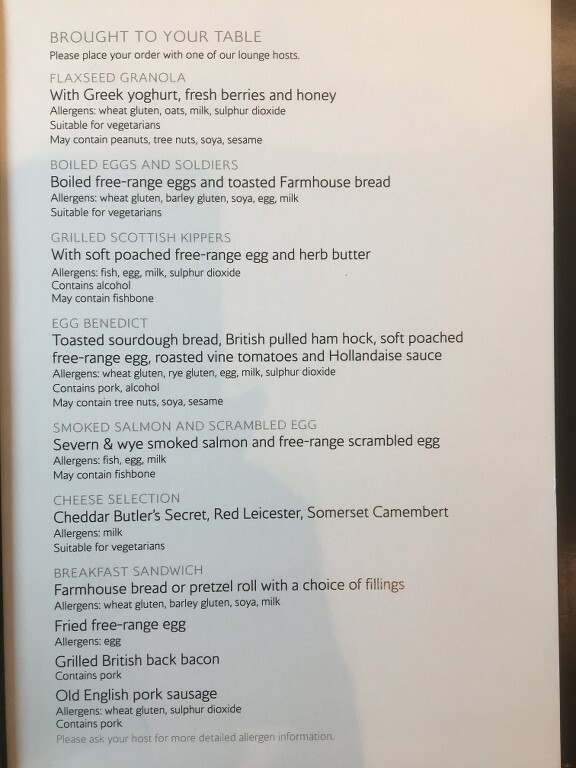 This thread gives the current catering options for the First lounge at LGW. This lounge is open to oneworld Emerald members, and passengers travelling in First oneworld. Not sure if this is still the current LGW lounge catering thread. It is, but it is probably worth updating what has happened here. When this thread [before the split noted below] was started, LGW First North didn't have a proper kitchen, just a broom cupboard, a fridge, a freezer and a couple of microwaves. So the Flounge menu there was somewhat constrained to zapping bacon baguettes. With the new South terminal BA have ended up with a kitchen which I think is significantly bigger than T5 CCR+Flounge. So the LGW Flounge now offers exactly the same menu as Flounge T5 and T3, which in turn is almost identical to the lounge menu in CCR. Breakfast in all the Flounges doesn't much change, the "rest of the day" menu does change monthly on the same day as LHR. The LGW First buffet is smaller than T5 and T3. however, given the much lower footfall compared to LHR. Flounge LGW now opens at 05:15, the above menu is not available until 07:00 hrs, but the hot buffet is available. So going forward any LGW user can see the current Rest of the Day menu in the CCR menu thread, which is often updated within seconds of it entering service! Just forget the Club sandwich. I have taken the liberty of setting this up as a new thread. 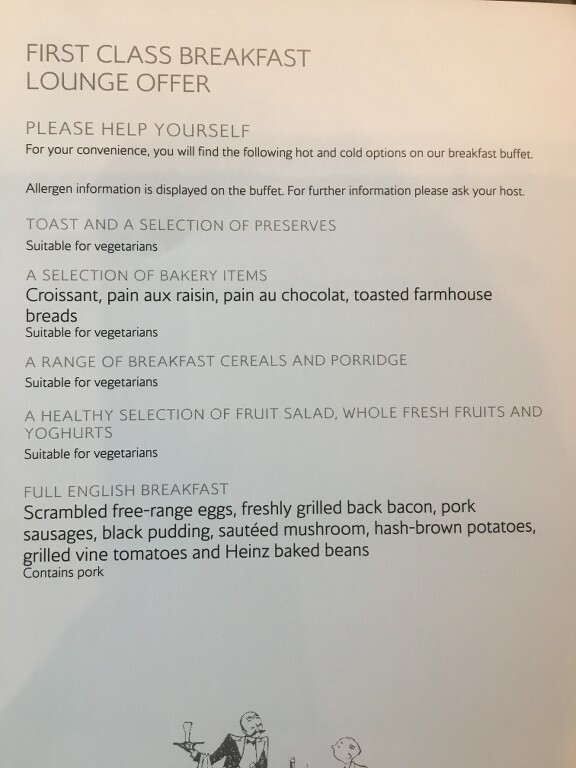 (Originally posted at the tail end of the First Lounge London Gatwick (North terminal): Catering options from April 2013 thread) A link to this thread will be added to the BA forum dashboard. Thanks for the original post, and the move! Not a big [or picky!] Lounge eater, but I've been very content with the offering in the LGW FLounge. Only used the Buffet ... I must try the Brought to Table offerings one day. I can heartily recommend the salmon and scrambled eggs for breakfast, The BA Burger isn’t as bad as people make out but the pasta offerings are usually spot on. I'm glad to see the black pudding is still there. Yesterday I had the Sri Lankan chicken curry and that was very nice sorry I didn’t post the menu as it was my first visit since the move from the North and thought the menu was posted already. I’ve been using other oneworld airlines or LHR until yesterday. Exactly the same chips, different oven. When did that start Sugar? I was there only a week ago and it was was 5.15 for the Business Lounge with the Flounge opening later. I went and slummed it ( it the Business Lounge and thought how pleasant it was with those views. I have the 6.15 to ALC, but needs must. When did that start Sugar? I was there only a week ago and it was was 5.15 for the Business Lounge with the Flounge opening later. A very recent change. Last Monday I think. Not that I'm checking up on this, I have a severe allergy to flying at that hour. Having said oven at Heathrow would be very welcome then! You and I both. I detest them - but that was the only BA flight to ALC that day. Still, that is good - I missed it by only a few days. Until what time is breakfast available? Trying to decide whether to eat in the Vauxhall Travelodge or the First Lounge before an 11.55 flight to Lima next month! The overnight stay in London avoids the need for an 06.40 flight from Edinburgh.